The sketch we have engraved shows Majesty's ship Rinaldo, of seven guns, in the act of bombarding the forts and town of Salangore, on July 4th, under a fire from all the fortified positions of that place. 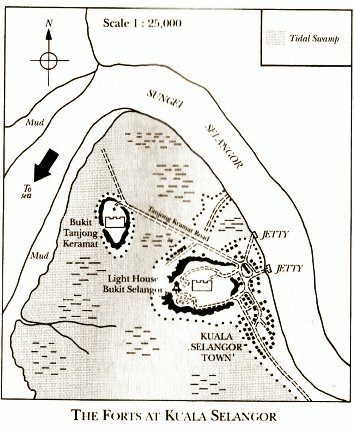 Salangore is a town situated at the mouth of the river which bears the same name, in the Malay peninsula, and which flows into the Straits of Malacca. The town itself is not shown in this particular view, as it is just inside the bend at the mouth of the river. The hill on the right, winch overlooks the town and defends the river is steep on all sides, and is surmounted by an earth work fort, mounting seventeen guns; it has also a stockade of bamboo round it. The low hill at the mouth of tile river is crowned by another earth fort, mounting nine guns. Lower down, and nearer the water, is an earth battery, mounting seven guns, which are 32-pounders. The ascent to these forts is extremely steep and rugged: they are capable, therefore, of a very strong resistance. The opposite bank of the river is low, flat, and densely covered with mangroves. Close to the water's edge are several wooden houses, having bamboo stockades round them, and each is armed with a few guns, which are masked. The cause of the Rinaldo's presence in the river of Salangore was the attack made the day before on a small party of her men, under the command of Lieutenant Maude, who were at the time escorting a Rajah to the boat for conveyance on board the colonial yacht Pluto for the purpose of an inquiry into the alleged protection of escaped piratical murderers, contrary to the treaty between the Sultan of Salangore and the Colonial Government; and also on account of threats and menaces used by his people to the police officers sent to arrest the pirates. The Rinaldo steamed into the river the next morning, but when she came abreast of the forts at the mouth they opened fire, by which three men were wounded and the ship and rigging were struck in several places. The ship at once returned the fire, and continued her course up the river. When abreast of the town she anchored. After a time the enemy's fire was silenced. The bombardment proceeded until four o'clock in the afternoon, when a town and a village on the opposite bank were in flames and the forts were considerably damaged and seemed to be evacuated. She then left the river, but returned two days afterwards and landed a detachment of troops and bluejackets from the ship, under cover of the guns. They completely destroyed everything that remained from the bombardment, including all the guns and magazines. When the news of this action reached England, the Queen sent a special telegram to inquire about the British sailors wounded.